S.N.A.C.K. - Students Need Athletics, Culture, And Kicks, was a project of Bill Graham to give back to the San Francisco community. When city budget cuts meant an end to all extracurricular activities in schools, he staged a concert with 11 performers and over 50 guest celebrities. 50,000 attendees at S.N.A.C.K. at Kezar Stadium raised enough money to keep extracurricular activities in San Francisco schools going for one year. The Poster/Handbill/Backstage Pass bundles contains a 1st printing poster, 1st printing handbill and a backstage pass. 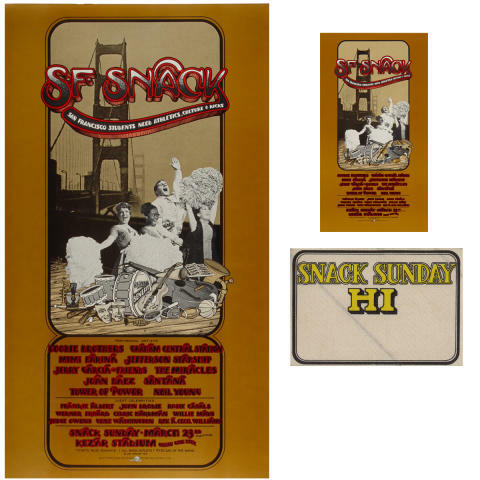 Randy Tuten is the only poster artist whose work spans five decades of design for The Fillmore. The 23 year-old San Francisco native was hired by Bill Graham in January, 1969, and their mutual taste for traditional, readable design style led to a long-lasting work relationship. Although influenced by the compositions of "Fillmore Five" artists Mouse, Kelley and Griffin, Tuten avoided "... Heavy meaning in my posters." Tuten's style reflected his skill as a draftsman, and his designs evolved into an eclectic mix of graphic imagery, lettering and photographs.